Trevor Ratcliffe Deliveries Limited (Ratcliffe) is Ireland’s largest supplier of transport and logistics services of Waste Electrical and Electronic Equipment (WEEE). 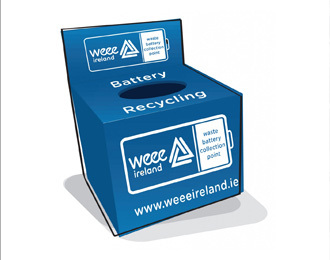 Operating to ISO standards Ratcliffe handles WEEE collection for WEEE Ireland and ERP while also directly engaged with the country’s leading electrical goods retailers and civic amenity sites across Ireland. In addition to the logistics services provided to retailers, households, county councils and industry Ratcliffe provides extensive consolidation and treatment services as part of its recycling focus in its purpose built Dublin site. We collect electrical waste of all sizes directly from businesses and households. Since the introduction of the WEEE directive we have proactively engaged with the retail sector and the public through information campaigns, Open Days for public to bring and collect of electrical appliances. Waste Electrical and Electronic Equipment (WEEE) is a type of waste covering any broken or unwanted electrical or electronic device. It includes a wide range of products from computers, printers and faxes, to washing machines and fridges. Electrical and Electronic waste (WEEE) is the fastest growing form of waste in the EU today. It produced approximately 9 million tonnes in 2005 and this figure is expected to rise to 12.3 million tonnes by 2020. Ireland has embraced the Directive so much so that in 2008 we collected over 9.5kg of electrical waste per person – more than double the EU target of 4kg per person! Ratcliffe continues to invest in its fleet and collection equipment stock to cater for the growth in WEEE collection and recycling and work with industry and householders to continue the reduction of waste to landfill. If you have any queries in relation to WEEE or would be interested in talking to us on how we can help your business please contact Trevor or Tanya Ratcliffe. The environment is at the core of everything Trevor Ratcliffe Deliveries Limited (Ratcliffe) does. From the collection, treatment and recycling of hazardous and non hazardous waste to the operating process we put in place, environmental best practice dictates our business approach.